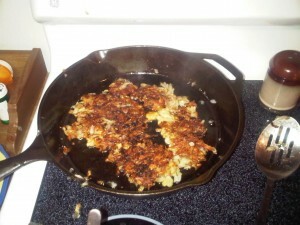 Start a heavy, large skillet heating (we use cast iron) on medium-high heat (set to 7 on our electric that goes to 10). Wash the potatoes and shred them with a grater, leaving the skins on. Spread the shredded potatoes in an even layer on a microwave-safe plate, and microwave them on high for 5 minutes, uncovered. Remove from the microwave and set aside. This step is important because to get crispy hash browns requires that excess moisture be removed from the potatoes before frying. Put the oil in the hot pan and swirl it around to coat evenly, then add the chopped scallions. Cook the scallions until tender and slightly browned, then add the potatoes in an even layer. 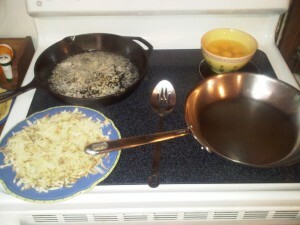 While the potatoes fry undisturbed, start another large skillet heating on medium-low (3 on our stove that goes up to 10). Crack the eggs into a bowl, add salt and pepper to taste, and stir them up lightly, as if making scrambled eggs. Meanwhile, let the potatoes fry without stirring until the bottom layer starts to get brown and crispy, then attempt to flip the whole mess over as a whole potato cake, as seen in the accompanying picture. Expect some breakage of the potato cake, but try to keep it in largish pieces. Let the potatoes continue to fry until the bottom starts to brown again, and once it looks like the potatoes are close to finishing, put some butter into the other preheating skillet to melt. The skillet should be hot enough to melt the butter quickly and with a little bit of sizzle, but not brown the butter. Once the butter has melted, add the eggs and salt and pepper to taste. Cook the eggs with intermittent stirring to make scrambled eggs. 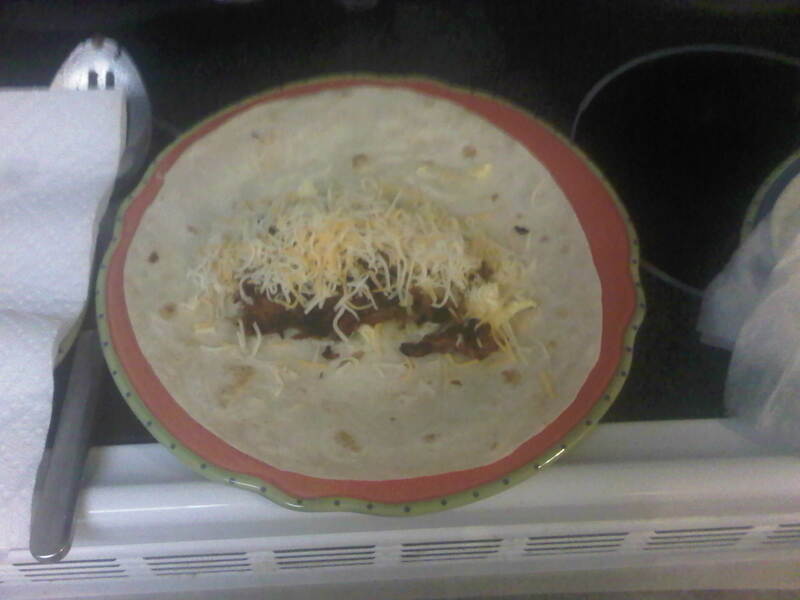 While the eggs are finishing up, put the three tortillas in the microwave covered by a moistened paper towel and heat for 30-60 seconds on high (depends on your microwave, but you want them piping hot!). The moistened paper towel keeps them from drying out and helps prevent cracking or tearing when you put together your taquito. Tip: It’s a good idea to pull the tortillas apart from one another before heating, so that there aren’t places where they are stuck together from being packaged together. If you don’t do this, then after you heat them and try to pull them apart you could create holes and tears in the tortilla where they are stuck together, and now much more delicate because they are heated, so it’s good to separate them while they are still unheated. Now we’re ready to assemble! Lay one of the tortillas on a plate, scoop some eggs and potatoes into it, put some shredded cheese (and/or salsa and/or Tabasco sauce and/or whatever you prefer!) on top, roll it up, and you’re ready to go! This isn’t a health food, so we rarely indulge in it, but some Sunday mornings you just need a nice, big, tasty breakfast, and this really fits the bill for us when that happens.